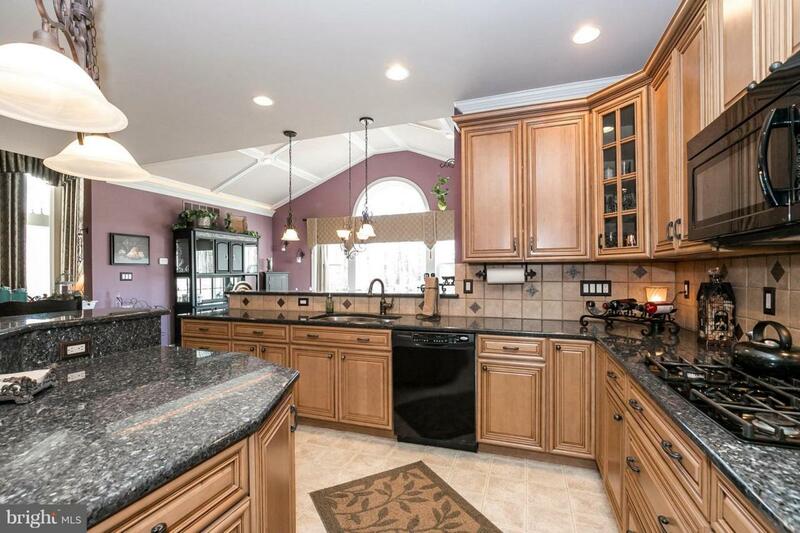 Simply Sensational home in the Chestnut Ridge Community and Downingtown School District! You'll feel right at home when you walk into this beauty situated on a partially wooded lot! The icing on the cake, a three-car garage! Walk in through massive double doors to an expansive foyer with oak tread turned staircase, wainscoting and natural banister. The gourmet kitchen is a pleasure to cook in, mingle with family and friends as it is expansive with a very open floor plan. 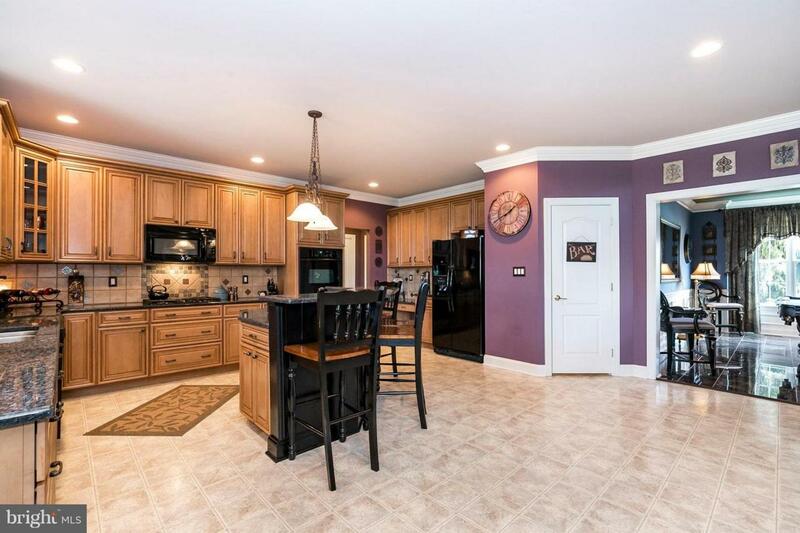 It features 42" Hallmark Oatmeal w/ Mocha Glaze Yorktown cabinets with clear glass corner cabinet, Blue Pearl level 5 granite, undermount stainless sink, Whirlpool black appliances including a double wall oven, microwave, dishwasher and gas cooktop. 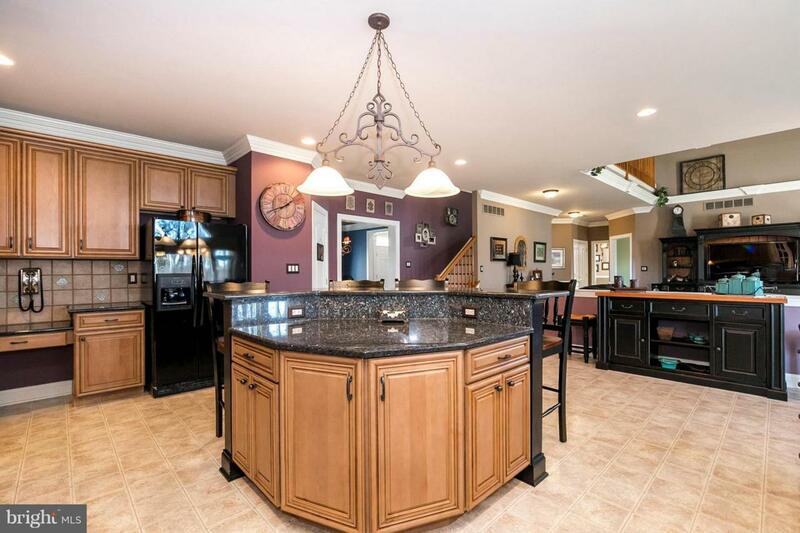 The counter top space is every chef~s dream, featuring a huge island with extra cabinet space and seating. Additional seating at the breakfast bar makes any gathering a breeze. Also includes tasteful tile backsplash, chandelier, pendant lighting as well as recessed lighting, and a granite kitchen desk. Breakfast room is a great addition with custom molding and lighting on the cathedral ceiling. Natural lighting brightens this room with an arched-top picture window and sliding glass door to patio. Relax in the spacious yet cozy family room with soaring windows and vaulted ceiling open to 2nd story. Rich in detail with its crown molding, marble surround and wood mantel gas fireplace, and ceiling fan. Formal living room has an elegant feel with crown molding, ceiling molding, and picture frame molding. Enjoy the cozy charm of its faux mantled fireplace. Spacious dining room for more formal meals with molding on ceiling, crown molding, wainscoting, triple window and marble floor. Private office on 1st floor offers a place to work with easy access to home~s amenities. 1st floor laundry has cabinetry and a drying rack. Powder room with tile floor, pedestal sink, chair rail and crown molding. You can access upstairs with front or back staircase that leads to catwalk hall. Master suite is steeped in quiet luxury with a relaxing window seat, crown molding, 2 walk-in closets and a sitting room with wainscoting. Master bath has a soothing soaking tub with custom tile, tile surround walk-in shower, double vanity and linen closet. 3 additional bedrooms are all spacious. Hall bath has tile floor, double vanity, linen closet and tile surround tub. Full insulated 9-foot basement has extra wide stairs leading to the yard, sump pump, and newer gas water heater. The property boasts a premier flat lot with bi level paver patio and sitting wall. You will want to spend all the time you can in this back yard. It has the perfect mix of open yard to enjoy and partial woods for beauty and seclusion. Expansive driveway with 3 car garage. The location is ideal for the commuter to Downingtown, West Chester, or Delaware. Located in the award-winning Downingtown School District with STEM Academy and the added bonus of being situated in a beautiful development!